The sage herb is one of my favourites. If I only had room for one herb, it would be sage - it looks and smells gorgeous, lovely soft leaves which give off a wonderful aroma, tasty when added to recipes, a wonderful remedy for respiratory problems, great cosmetic uses and its lovely flowers feed bees. There are many different varieties but the golden sage will only flower in warmer climates. Narrow leafed sage is best for culinary uses but I love my golden sage. It can be quite short lived - will die after a few years for no apparent reason, so it's best to take some cuttings each year. You can give them away, put them on sale for the school or church fete or even start a little backyard nursery going with the surplus. 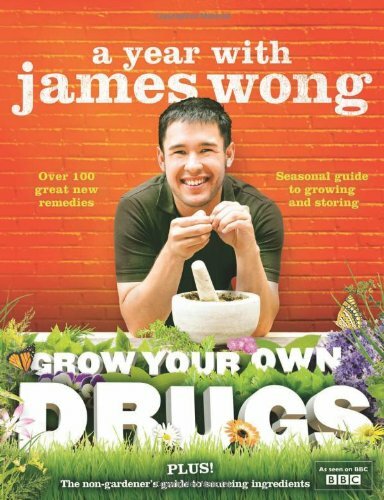 There's lots of other articles in this issue of Herb Guide News - a fabulous article about herbal cold remedies, most of the stuff you'll have in your cupboard, so you'll not be stuck for a quick relief from the snuffles. You've got some ideas for making homemade gifts and some 'I want one of those' specials for yourself or a loved one. 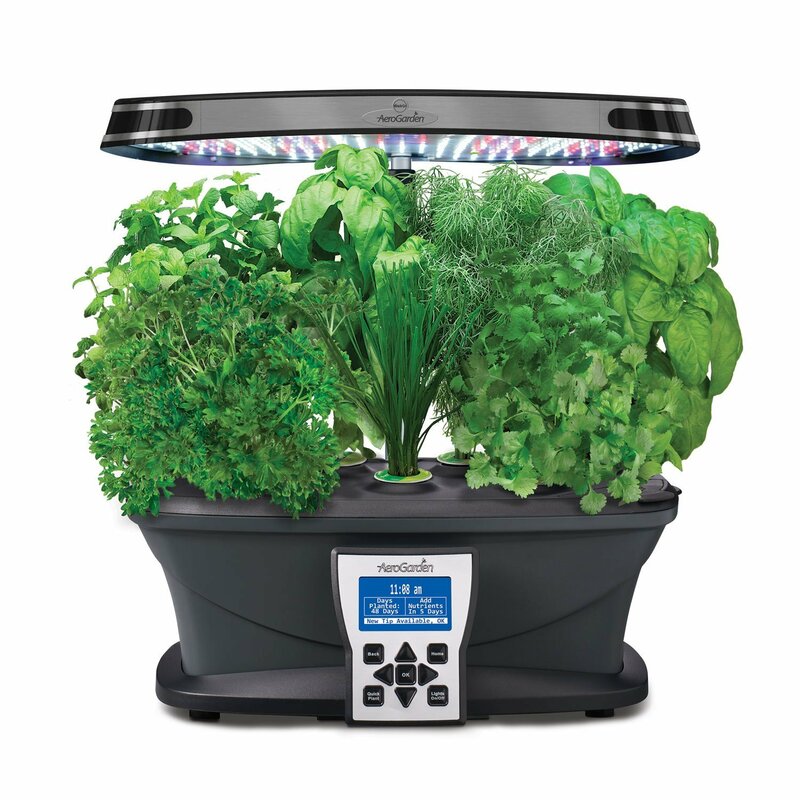 Indoor herb gardening is becoming very much the rage these days. You can just snip a few herbs off the stems, grab a tomato or chop a chilli while you're cooking. The indoor gardens look gorgeous in the house too with their lush green foliage and gentle background light. 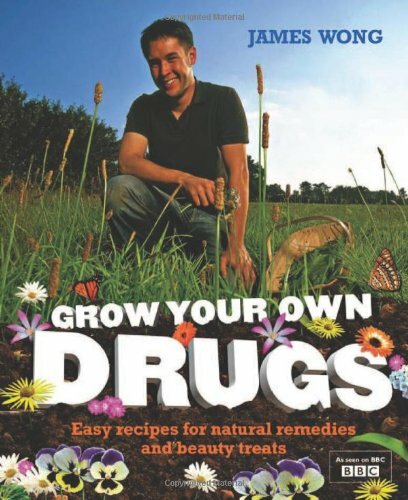 You can grow flowers and buy blank pods to select your own seeds. programme the lights for optimum growth - it's not what you think! You have got to have sage and onion stuffing for your turkey - Thanksgiving, Christmas, Holiday, call it what you will, but you've got to have it. I love it and I always make it when I have chicken as well - I like to think of my roast chicken as a mini-Christmas dinner. It is so easy to make and there is no comparison to shop bought - you'll never buy another packet again. You can use fresh or dried sage and the taste will be just as good. 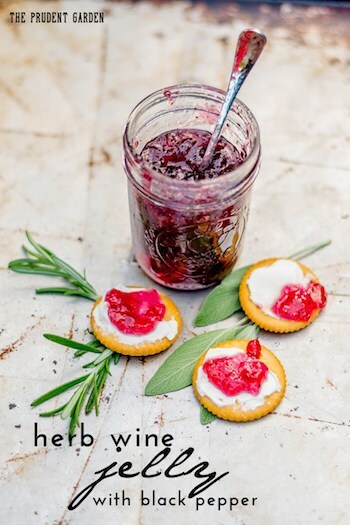 All I can say is 'wow' - Herb Wine Jelly with Black Pepper from PrudentGardener. If you're looking for a change from cranberry to serve with your turkey, then give this a try. It is absolutely delicious and goes with anything - all meats and cheese. I can't imagine anything it wouldn't be great with - much like the new Chilli Jam that's been sweeping the board in the last couple of years. 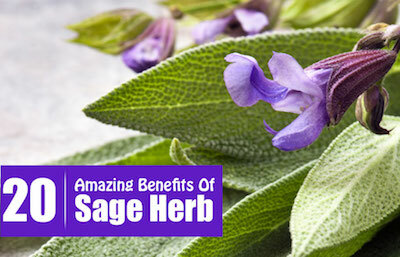 Sage herb is one of the ones to use. 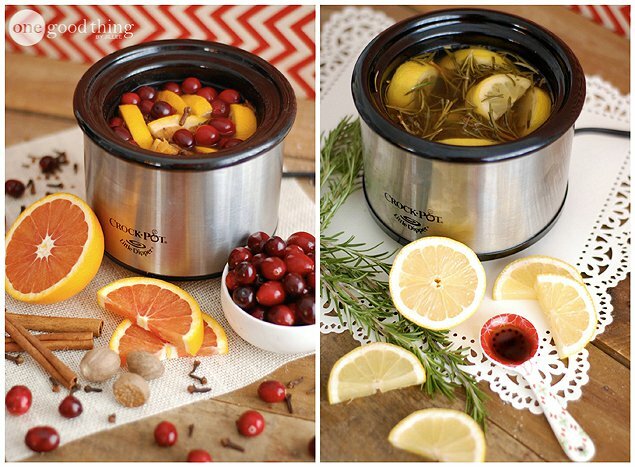 Pot pourri recipes for the Holiday season from OneGoodThingbyJillee. You can use a slow cooker for these or just a pan on the stove - BUT set a timer to remind you to check frequently, so it doesn't boil dry. Alternatively, you could pop a loaf tin into the oven with a mixture and then leave the oven door slightly open as it cools. Your house will smell very festive if you use these mixtures. Try a combination of any of these to make your own mixture. If you can't get any of these ingredients, you could substitute essential oils - so for instance, sprinkle a few drops of eucalyptus oil onto the rosemary prior to adding it to the pot. You could make up some bags of these as homemade gifts - just make a little label listing the ingredients, the amount of liquid required and a warning about using a pan with a timer. If you're feeling really generous, then a small slow cooker could accompany the bag! A money saving tip is to save the skins and flesh from fruit you've used - pop them in a freezer bag so you can bring them out when you're ready. 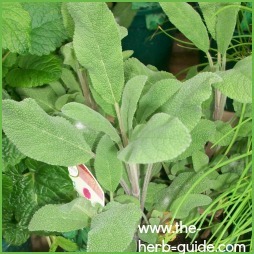 Growing sage is straightforward - a lovely mostly evergreen small shrub with lovely fleshy leaves. It comes in several varieties, but the Broad Leaf English Sage (photo above) is the most commonly used for culinary purposes. It has a tendency to die off quite early, so it's best to keep propagating new plants - read more about growing sage - click on the photo. There are at least 20 Sage Herb Benefits - not just for stuffing turkeys! It's good for the skin, hair and has numerous health benefits. Read this handy guide to see how useful sage is. I saw this idea months ago and thought I'd save it to share with you as a table decoration idea you could adapt for yourself. It needn't be just for Christmas - you could put a sprig of herbs in the upturned glass, a small ornament, tree bauble or anything you fancy. 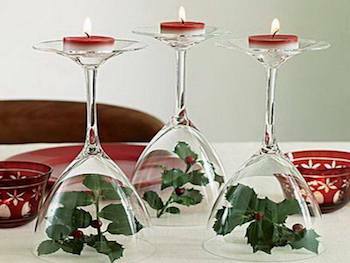 The tea lights are lovely and as the wine glass rim is quite wide, I think they'd be very stable and unlikely to get knocked over. As with all naked flames, don't leave them unattended - a child or animal could knock them over and they could start a serious fire. 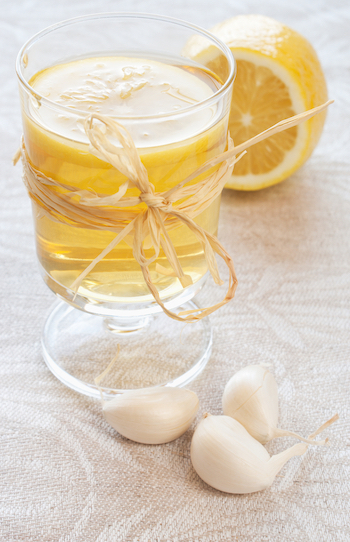 This fabulous cold and flu remedy will warm and soothe you. It's full of vitamin C which is a great immune system booster, garlic for antiviral/bacterial properties, honey for antiseptic and soothing properties and ginger for warmth. I like to take mine in hot water - I can inhale the fumes at the same time and it's very comforting. There are other options if you don't like to take garlic - some people find it a bit anti-social - click on the photo. 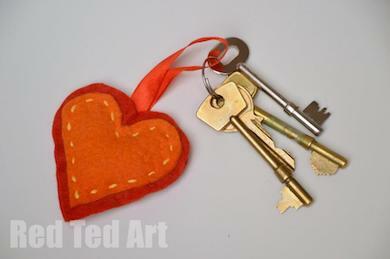 Two great uses for one kid's project - lavender stuffed hearts from Maggy at RedTedArt. These are lavender stuffed and hand sewn - most children could manage these with a little help. 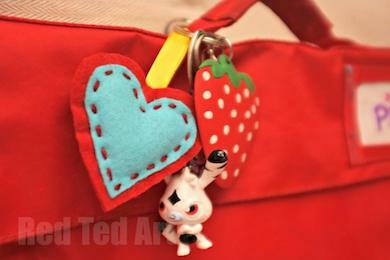 It could be a keyring for Grandma or a school bag tag for their older siblings. Stuffed with lavender (you don't have to, but it's padded so you might as well stuff it with something that smells nice!) they make a great gift any time of year. You can't leave your pets out so these Chicken, Parsley and Peanut Butter Frozen Dog Treats from Chungah at DamnDelicious are just the job. Three ingredients, and you could use the turkey carcass instead of chicken if you prefer. Just a cup or two from the Thanksgiving turkey stock would be lovely. 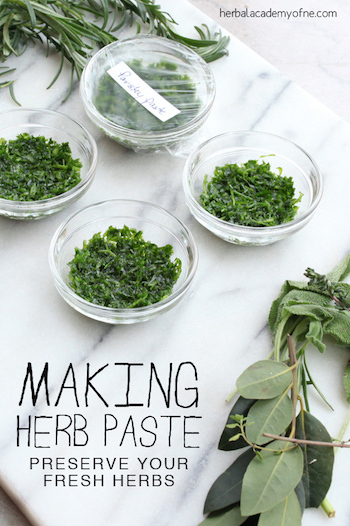 Excellent instructions for making herb pastes from the Herbal Academy of New England. There's also a handy list of traditional health benefits to refer to. 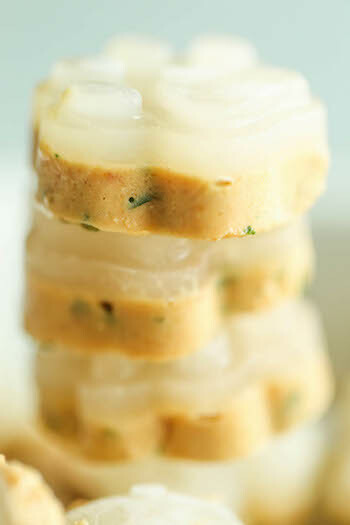 The pastes will keep for around two weeks in the refrigerator or you could freeze them. I would add the sage herb to this list as well if you pick the young leaves. Anything you can do in advance of a big family meal for Thanksgiving or Christmas is a help. Chopping herbs often leaves a mess - something about water and chopped leaves. I always find I'm picking bits of green leaf off all over the place. A great way to cook pork chops with sage herb and tomatoes. It's a short video and to save you having to rewind or pause it, I'll list the ingredients for you here. 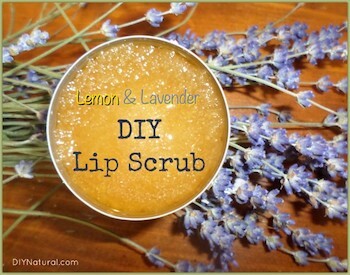 This is a great lip scrub from DIYNatural - you don't have to use lots of different oils if you don't want to. I sometimes use a bit of olive oil - so use what you've got in to see if you like the scrub first. It's so useful in winter to do a gentle exfoliation as lips often get dry and chapped. The heat indoors and the cold outside really take their toll and leave your lips dehydrated. 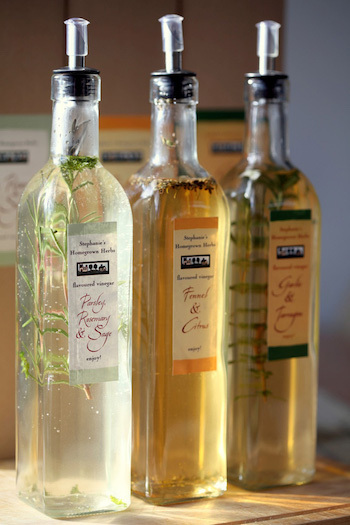 These Herb Infused Vinegars from Evermine would make great gifts for family and friends. You've got time to make them before the Holidays - they need about a month for the herbs to flavour the vinegar, then you strain them and add another fresh sprig if you want. Fabulous for making salad dressings adding a real herby zest. My very best recommendation for online Herbal Medicine Courses has to be the Herbal Academy of New England. 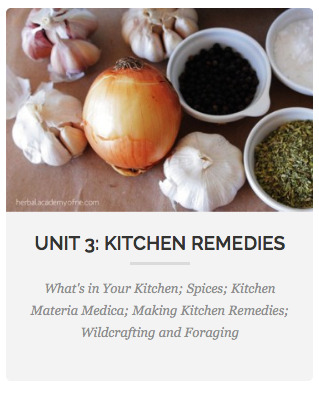 This Unit 3 of the Introductory Course is one of the best - it's the one most people can relate to, being kitchen remedies. 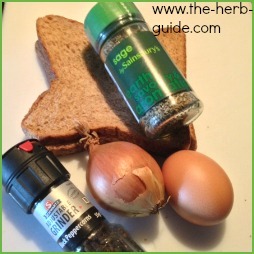 There's information about using culinary herbs in medicinal quantities. Read the review of this unit by visiting the link to Unit 3 HANE Introductory Course or clicking on the photo. 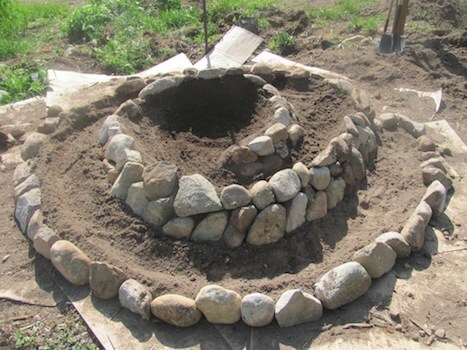 What a fabulous garden project to plan. A herb spiral looks gorgeous. It doesn't seem to matter what time of year or how much growth you've got on the plants, they make a great feature. I sometimes think the best time of year to do these jobs is the late fall as you're clearing stuff anyway and it's a good time to organise your space. 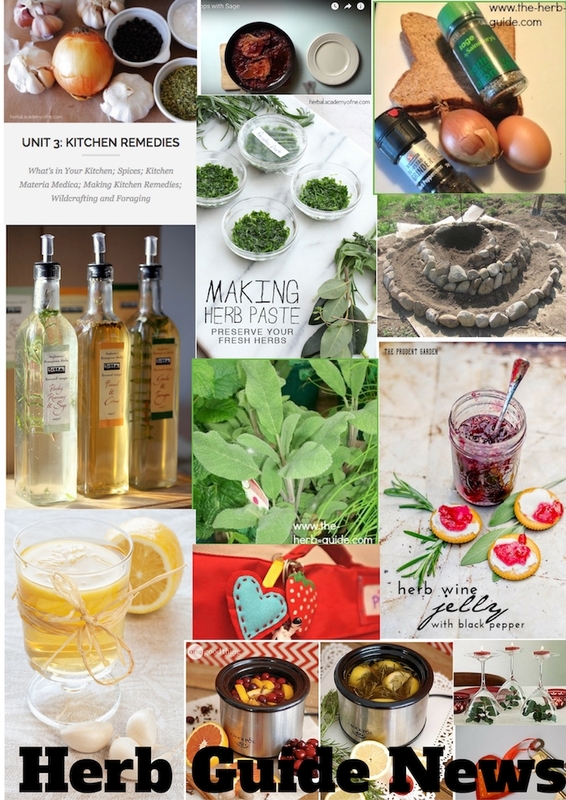 This is a step by step tutorial from FamilyFoodGarden - pop over, have a look at how it's built and read the tips about selecting herbs - the old rules still apply, making sure that you confine your mint otherwise it will take over. A great checklist here of 10 Things to Holiday Proof Your Kitchen from OneGoodThingByJillee. 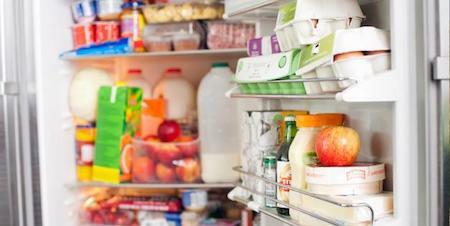 Some handy checklists for supplies and 'to dos' that will prompt you and get you ready.